"The opening of Hilton Makkah Convention Hotel marks Hilton's 12th hotel in Saudi Arabia," said Andreas Lackner, regional head, brand management, Hilton. "With more than 30 hotels under development, Saudi Arabia features our largest development pipeline in the Middle East and we look forward to extending our renowned hospitality across the country." 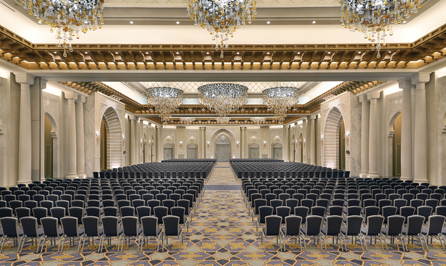 Hilton Makkah Convention Hotel caters to meetings and events of all sizes, with the largest pillar-less ballroom in Makkah, and the ability to accommodate up to 1,600 people. The hotel boasts the first and largest convention centre in the city, and is joined by an additional eight multi-purpose meeting and boardrooms. Hilton Makkah Convention Hotel boasts three restaurants and a cafe where guests can indulge in various eclectic cuisines. The elegant ambience of the all-day Al Mustafa restaurant offers guests an international buffet. Alternatively, Azure serves Indian and Malaysian cuisine, and Sahtein serves Lebanese food. In addition, guests can enjoy a casual setting at Al Multaqa Café, offering light snacks. "We are delighted to be welcoming guests looking to stay in the heart of Makkah," said Mark Allaf, general manager, Hilton Makkah Convention Hotel. "Hilton Makkah Convention Hotel offers contemporary accommodations in one of the world's most monumental cities. With its spacious ballroom and convention centre, the hotel is ideal for meetings and events of all sizes." 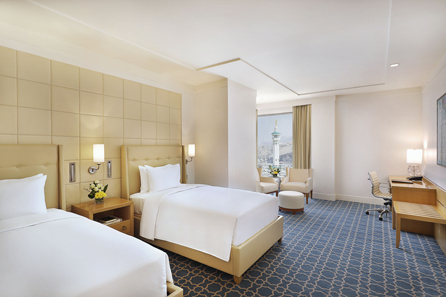 The hotel offers 764 contemporary guest rooms with large modern walk-in showers, including 90 executive rooms, 25 executive suites and 16 suites with views of Haram. Guests will also have access to the 24-hour fitness centre featuring the latest state-of-the-art equipment. Hilton Makkah Convention Hotel is part of Hilton Honors®, the award-winning guest-loyalty program for Hilton's 14 distinct hotel brands. Hilton Honors members who book directly through preferred Hilton channels have access to instant benefits, including a flexible payment slider that allows members to choose nearly any combination of Points and money to book a stay, an exclusive member discount that can't be found anywhere else and free standard Wi-Fi. Members also enjoy popular digital tools available exclusively through the industry-leading Hilton Honors mobile app, where Hilton Honors members can check-in and choose their room. Hilton Makkah Convention Hotel is located at Jabal Omar, Ibrahim Al Khalil St, Makkah, 21955, Saudi Arabia. .